The robust and superiorly designed Jindabyne Freestanding Wood Heater is ideal for those seeking an economically priced heater with maximum heat output. Suitable for heating larger areas of up to 180m2 (18 squares), this classic radiant heater is available in a durable Ironbark finish that compliments both modern or traditional decor. Features include a steel baffle with a 6mm firebrick lined firebox. 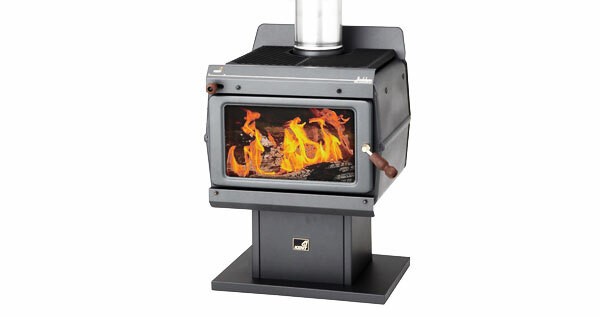 The high output firebox, the heart of all Kent Wood Heaters comes complete with 10 years warranty. This wood heater also features a large ceramic glass door, which enables you to have a maximum view and enjoyment of the blazing fire inside. The included fitted trivet accessory is perfect for cooking soups, making coffee, reheating stew or boiling the kettle.